Solid offense for men’s soccer leads to victory against Muhlenberg | The Gettysburgian. 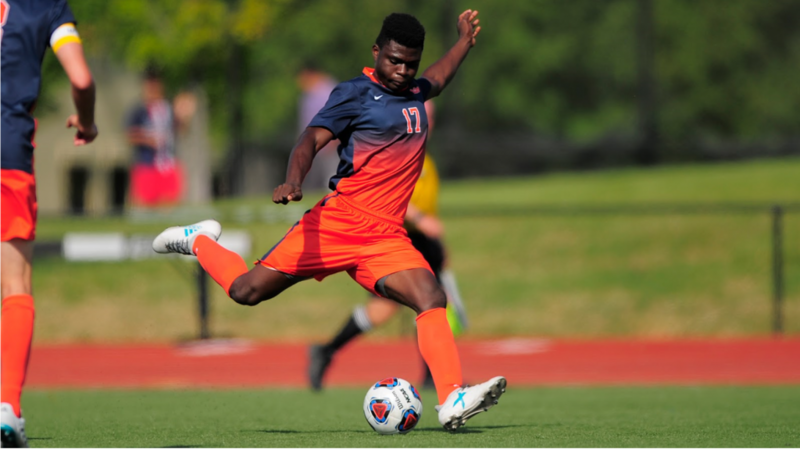 The Gettysburg College men’s soccer team has had a dominant performance so far this season as their first eleven games has put them at a 9-2 record. Their most recent match-ups have featured wins against No. 23-ranked Haverford College by a three-goal margin of 4-1, Eastern University by 2-1, and most recently Muhlenberg College by 2-0. During the Muhlenberg game in Allentown, the two goals were scored by sophomore Ezekiel Omosanya and senior Patrick Santini, who were assisted by first-year Sam Lerman and sophomore Jimmy Evangelos, respectively. The road win against Muhlenberg is just a preview of what has been a strong year for the men’s soccer team as they remain undefeated on the road this year (5-0) and are second in the Centennial Conference standings, behind only Johns Hopkins. The Bullets are led by team captain Patrick Santini, who — thanks to his performance against Muhlenberg — has been awarded Centennial Conference Player of the Week honors for the fourth time this season. Santini currently heads the Centennial Conference in goals with 16 so far this season and in points with 34. He also ranks second in the Conference in average goals per game with 1.45, and he is tied for second in points per game at 3.09 and tied for first in game-winning goals at 7 and also 2 assists for the season so far. Senior goalkeeper Max Karen has provided the Bullets with muscle on the defensive side this year. In the six games he has started as the goalkeeper for the Bullets, they are 5-1. This season Karen has only allowed 4 goals, making an average of only 0.63 goals a game and contributing greatly to the Bullets’ success this season. Karen started at Muhlenberg last Saturday and allowed no goals, which helped the Bullets to their undefeated road performance. First-year Erik Carneal captured the Bullets’ feelings about this year by expressing the optimism that the team has as a result of their success so far. “Our senior captain Patrick Santini has had his best this year. Our defense is also strong and still young so we have a bright future ahead,” said Carneal. First-year Nolan McGrann also agrees that the chemistry of the team has played a big part in the team’s success. “For sure, the chemistry is good and has helped with our recent victories. I know that I have improved thanks to other teammates helping me and my friends getting better because of our relationships with upperclassmen,” McGrann said. Gettysburg hopes to continue their strong offensive attacks and consistent defense, and they want to utilize their team chemistry for a great rest of the season. The Bullets Men’s Soccer team will look to build upon their impressive year with a home game against Dickinson College on Saturday at 7 p.m. and against Franklin & Marshall on Wednesday at 7 p.m.